The Avery Dennison printer family has been enhanced by a new member, the AP 3.4, Avery now offers a direct thermal and thermal transfer printer. At 203 dpi, the AP 3.4 delivers good quality that can be printed at speeds of up to 150 mm/s. AP 3.4 is equipped with the standard fonts; additional soft fonts can be integrated with a simple download. It also, of course, allows scaling up to a factor of 24 and/or free rotation. 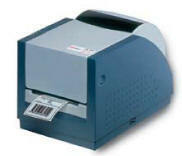 All standard barcodes are contained in the basic configuration. The supplied print software makes designing labels quick and easy. You can use the AP 3.4 as s standalone unit to integrate it into your computer system. Drivers for Windows 3.11/95/98/2000/NT/ME and XP are included. It does not matter which media you use - the AP 3.4 handles all of them without a problem. from a roll, ready-cut or continuously from a stack, tags, card made from thermal or normal paper with a thickness up to 250 g/m², even textile labels. The ribbon feed capacity of 300M keeps downtime to a minimum. Weighing in at just 4.2 kg and with an attractive pale-gray casing, the AP 3.4 cuts a fine figure in any surroundings but it is also robust enough to put up with a lot. And one more thing: AP 3.4 speaks EPL & DPL!